Lisbon’s history is rich. It has a vibrant energy with a new generation that is looking to the future and enjoy having fun…. As such there is a great mix of traditional cultural events with Opera, Dance, Theater and classical Music, together with Fado houses, little know bands playing in basements, jazz, drag shows, great clubs and discos. You will be spoiled for choice. Baixa, home of PR, CN, FI, and CR apartments, is the one of the most charming neighborhoods of the city. The medieval city center, including the Royal Palace was destroyed in 1755. Rebuilt with much stronger buildings, it survives to our day. Three elegant squares (Praças) dominate the Baixa – Praça do Comércio by the river, the northern end, Rossio with the classical Teatro Nacional and Praça da Figueira. 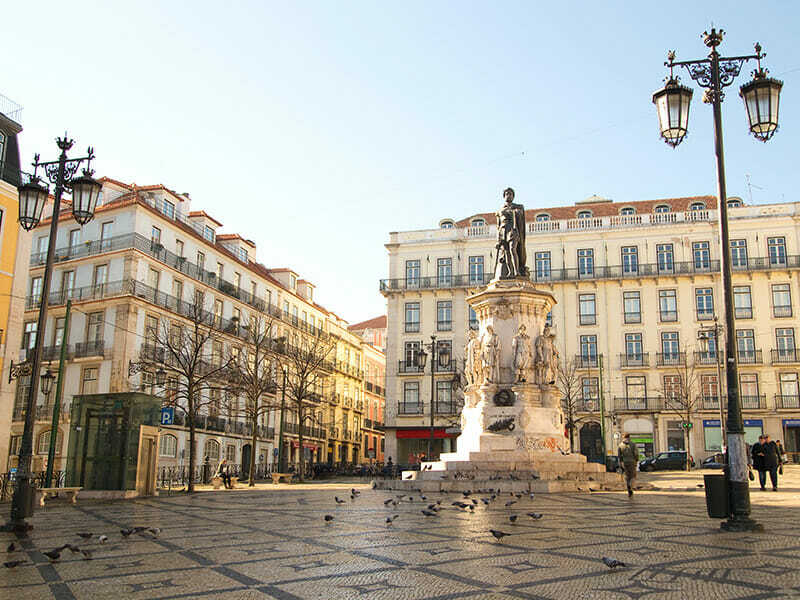 Chiado, home of LV Premier’s CH apartments, is the prime shopping area of the city anchored by Armazéns do Chiado – an icon that is now a shopping center. Upscale stores, restaurants and the Theater district are minutes away. This area is being considered for a World Heritage Site status. The area of Príncipe Real, (PI, FL) started its urbanization in the 1700s with the building of a convent from the Company of Jesus, subsequently turned into the Colégio dos Nobres/ College of the Noblemen, and later becoming a part of the University of Lisbon, and now Museu da Ciência- which still houses the priceless Botanical Garden. The area saw a number of residential palaces for wealthy individuals being built from the late 1700s and being subsequently expanded right into the turn of the century- resulting in an interesting mix of styles. The name came in the late 1800 to honor the son of Queen Maria Pia. The area is now know for eclectic shops, nice restaurants, antique dealers, and a number of popular bars and clubs. It has a number of gay bars. Praça do Príncipe Real hosts a organic produce market on Saturdays. Praça das Flores is most loved leafy square of the city. Anjos (home of AR apartments) is a vibrant city district. Minutes away from both Praça da Figueira and the geographic center of town, and it is also close to the historic neighborhood of Graça and Alfama. There is a traditional market- Forno do Tijolo and a number of well known seafood restaurants (e.g. Ramiro). The area is multicultural mix of young and old- where eclectic and bohemian, cohabit easily with the traditional and established. A few yuppies and artists have taken residence in the area. The Praça do Intendente, with a number of interesting bars and restaurants, has reclaimed its status as the heart the of the quarter. Campo de Ourique, LV Premier C. Ourique – CO1’s neighborhood, was settled as a residential area in the 19th century. Currently considered one of the best areas in Lisbon, it is a one of the most sought-out areas by Lisbonites and visitors alike. It is a neighborhood with a peculiar rhythm and a unique identity. The grid pattern streets have buildings spanning the traditional, Art Noveau and modern styles. Campo de Ourique welcomes many traditional trades, new and old, and all are worth a visit. Campo de Ourique has a variety of attractions of which you should not miss Casa Museu Fernando Pessoa, Jardim da Parada, Santo Condestável church and the Market and its gourmet food stalls. The famous No. 28 tram (Elétrico) starts in Campo de Ourique and is one of the better ways to visit the traditional neighborhoods of Lisbon across the 7 hills. 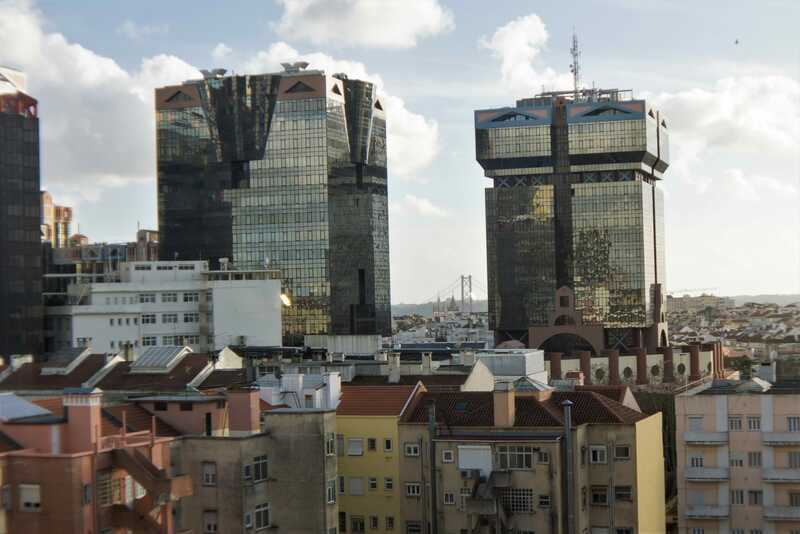 The monumental Basilica of Estrela, Jardim da Estrela and Torres das Amoreiras, a controversial architectural project where is located the appreciated commercial space of Amoreiras- are all within a easy walk.  Amoreiras, in the heart of Lisbon, is home to our LV Premier Amoreiras – AM1. It is an upper-middle class residential area and it counts as neighbors some of the best hotels of the capital as well as some of the city’s top offices. One of its main landmarks is the Amoreiras Shopping Center, the first large shopping mall in Lisbon, which retains its upscale and exclusive feel. It is considered one of the neighborhoods of the city with better quality of life. The area was formerly an agricultural field transformed into a residential neighborhood in the late 1800s. The Amoreiras have a very close relationship with Campo de Ourique and Campolide neighborhoods, traditional areas of Lisbon where “life happens with a very own rhythm”. It is also a short walk away from Park Eduardo VII, which crowns the Avenida da Liberdade, which in turn leads to the Baixa and the riverside. Amoreiras is home to several luxury hotels, the beautiful Jardim das Amoreiras, the Águas Livres Aqueduct which ends at the “Mãe d’Água” (Mother of Water), a must visit place. Lisbon offers a wide choice of entertainment options. Here is a small sampling. Other interesting rooftop bars are the SKY bar (Tivoli Hotel), Park near Bairro Alto; Topo in Martim Moniz. 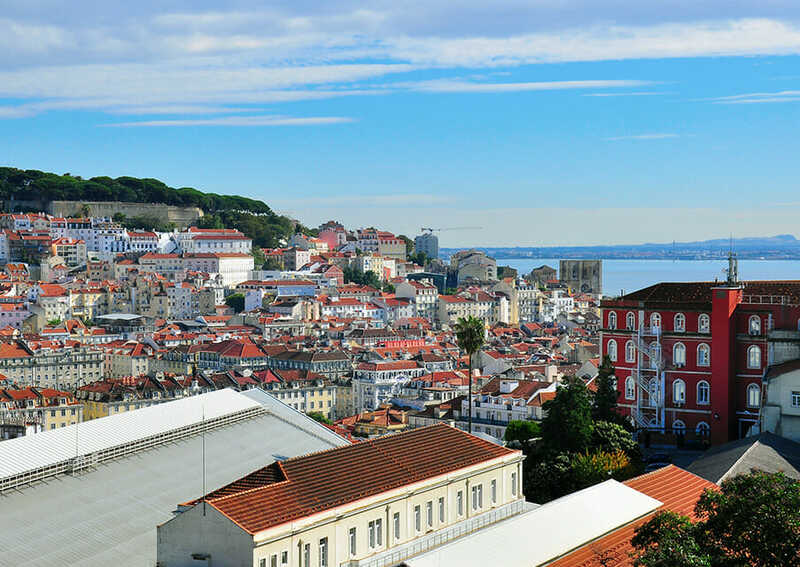 Lisbon has a vibrant GLBT scene and cherishes its GLBT travelers. The heart of the gay community still resides in the Bairro Alto – Príncipe Real axis where a number of bars and clubs exist. Over the last few years a number of new bars have opened. Together with perennial favorites, such as Construction, Trumps and Finalmente, the newer arrivals such as TR3S and Cru are making their mark. Most people start the evening in Bar da Esquina in Travessa da Espera in Bairro Alto before heading out to one of the bars. Be prepared to stay up late, as most discos do not get going till 3 am. There are four major areas you must consider when going out at night: Cais do Sodre and Bica, Av. 24 de Julho (Alcântara, mainly bars and discos), Bairro Alto (plenty of restaurants, bars and discos), Docas (Doca de Alcântara, plenty of restaurants, bars and discos) and Parque das Nações (mainly restaurants and bars). All offer lively entertainment into the wee hours of the morning. International Queer Film Festival is a Film Festival dedicated LGBT themed films, a genre known as Queer Cinema. Since its first edition in 1997, the festival has grown and consolidated its reputation internationally- and it is now one of the most recognized festivals of its genre at a European level and worldwide, for the quality of its programming and activities as well as the guests that it attracts. The programmed films are organized in the Competitions for Best Feature Film, Documentary, Short Film, School Film (short format) and Queer Art, this last one dedicated to more experimental languages. In parallel to the central program there will be non-competition sections, special screenings, film programs dedicated to a filmmaker, theme or country. A building with several awards by Portuguese architect Siza Vieira holding the collection of painter Julio Pomar, interesting temporary exhibitions and charming grounds. A step away from Camoes Square and our Principe Real Apartments. A number of beaches are easily reachable from the city center, either going to Estoril and Cascais, or crossing the bridge and going to Costa da Caparica. We can loan you beach towels for a small fee if mentioned before arrival. Jogging in the river front – One of the favorites for Lisbonites and visitors alike is to go for a jog between Cais do Sodré or Docas to Belém Tower or Algés and back. Most of the way is river side and it is a nice way to take the city in and enjoy some of the monuments in the Belém area. An alternative is to explore the river front in the Parque das Nações area with more than 6 km with very interesting architecture, different thematic gardens and river side breezes. Bike riding – Although Lisbon is quite hilly there are a few itineraries in the river front that are mostly level, and there are also electric bikes for hire to discover the other parts of town. A personal favorite is to head on to the river. Golf – In addition to the Algarve fine golf course exist nearby Lisbon. Discover the Alfama side of town on foot, and take a moment or two as you climb to take in the stunning views. The Moorish castle has a lovely coffee house perfect for a rest. You can reach this area from Baixa with little effort, taking the free elevator in Rua dos Fanqueiros (Elevador da Baixa) which will bring you to the top of Rua da Madalena. Cross the street and head towards the sign of Pingo Doce supermarkets/ Chão de Loureiro where you can take a second elevator (offering panoramic views of the city) This will bring you almost to the level of Castle, enabling you to arrive refreshed. This is also suitable for wheelchair, but be warned of cobblestone streets and a small slope upwards at the end of the way. Re-built after the earthquake, it nevertheless keeps narrow streets with a variety of really interesting stores. Somewhat quiet during the day, it explodes with activity in the evening- this is one of the hotpoints of Lisbon’s nightlife with a multitude of bars, restaurants and clubs. Small garden with great views of the city. Take Elevador da Lavra from Avenida da Liberdade and follow the signs. You will be rewarded with unbeatable views of the city and some quiet. Amoreiras 360º Panoramic Views– The ViewPoint. The newest attraction will enable you to see far and enjoy all of Lisbon. Open till 22H and currently 5 euro. By the Amoreiras Shopping mall. Cascais and Estoril are a seaside resort and the closest thing to a Riviera in Lisbon. Great food, entertainment and beaches are some of the reasons people go there. Montemor is a village located in the middle of Portugal, close to the intersection of major highways only 1 hour away from Lisbon by car. Montemor marks the ancestral force of religious and agrarian nobility orders, expressed in beautiful eighteenth century manor houses, in multiple convents, in churches that associate Manueline, rich baroque altars and unforgettable fresco and azulejos. If you enjoy modern art (XVI-XVIII centuries) you will be spoiled for choice. The key points to visit are Convent of St. John of God, Matriz Church, Terreiro of Saint John of God, the Salutation Convent, the Church of Mercy, the Chapel of Our Lady of the Visitation, Carvalho Church, the Archaelogic Museum, and the castle of Montemor-o-novo. The most striking art pieces are the frescos inside Matriz Church, the altars and the marble Pieta from the Chapel of Our Lady of the Visitation, the coated azulejos from the Salutation Convent. Explore the castle at your leisure, passing through the Village Gate, next to the Guard House, and with the necessary care, climb the stairs of access to the Clock Tower. From this point of the wall you’ll find an unique view of the ruins of Palace of Mayors- which have lodged various monarchs and where they met the Court. Cacilhas is a river front district of Lisbon in the south bank of the Tagus. Take a 10-minute boat journey from Cais do Sodré to discover this village, enjoy one of the most beautiful views of Lisbon and sample several restaurants known for their fresh fish. It was know as a working class district, where shipbuilding dockyards operated- you can visit the remnants of the industrious past. Also nearby you can visit the Monument to Christ (strikingly similar to Cristo Rei in Rio de Janeiro). 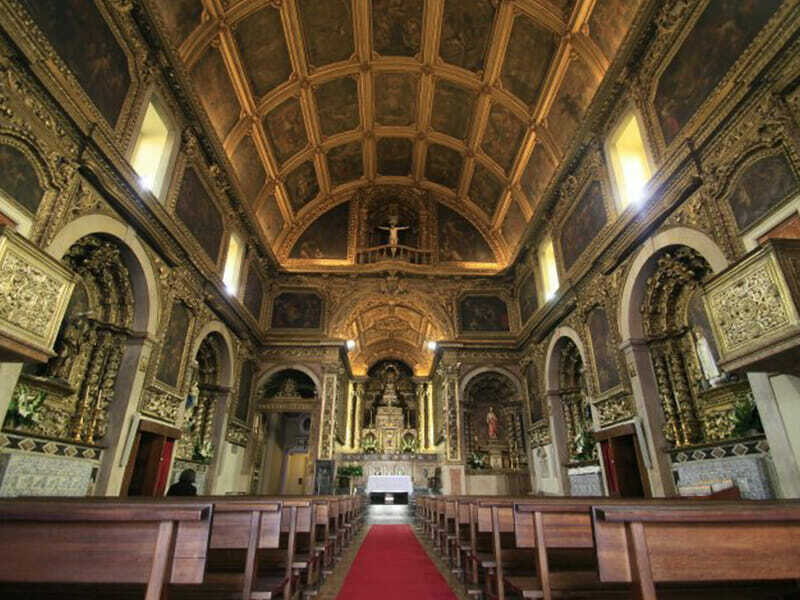 You may also visit the Church of Our Lady of Safe Homecoming, built in 1759 with a beautiful gilded interior and tile panels. Across the road you find a large vessel from the 1800s (the “D. Fernando II e Glória”), which may be visited every day except Mondays (free admission on the first Sunday of the month). Mafra is a city and a municipality in the district of Lisbon, less than 30 min distance by car. Mafra is mostly known for the sumptuous Mafra National Palace built in the baroque style. The Palace also inspired Portuguese Nobel Prize laureate José Saramago to write his novel Baltasar and Blimunda (Memorial do Convento) and was classified as a National Monument in 1910- one of the finalists of the Seven Wonders of Portugal. Around the Mafra National Palace you will find the Tapada Nacional de Mafra- a natural park with more than 8 square kilometres, home to different species of deer, wild boar, foxes, birds of prey and many others coexisting in an unusually rich and diversified natural habitat. The Tapada is also open for walking, mountain biking, horse riding, archery and crossbow shooting activities. Other points of interest around the municipality include Churches from various period of times with original details (Nossa Senhora da Encarnação, São Pedro, Paroquial da Ericeira, Matriz de São Silvestre do Gradil, São Silvestre e Santo André). Cabo Espichel is a cape located to the west of Sesimbra- approx. 1 hour driving time from Lisboa. Pilgrims were drawn there due to impressive views of its cliffs facing the Atlantic Ocean, and it is a popular day trip from Lisbon, frequently including Sesimbra. The location is famous for the sanctuary complex (Santuário de Nossa Senhora do Cabo Espichel), built extremely close to the edge of the tall cliffs, which includes a church still in use today. You will also find several dinosaur fossil track ways exposed in some of the now tilted Jurassic strata which form the cape’s cliffs. It is said that local superstition interpreted the tracks as the path taken by the Holy Virgin (“Nossa Senhora”) when riding a giant mule from the ocean and up the cliffs, which led to the eventual construction of the convent at that location. Don’t forget to take a tour around Sesimbra – an old fishermen’s village, and popular beach resort with a lot of old restaurants and houses but also affordable restaurants near the beach. Meco is another village nearby, known for its artsy types and alternative life styles popular with Lisbonites.